To keep your stones their cleanest and brightest, remove your ring when taking a shower, washing your hands, and doing the dishes to avoid soap scum and mineral deposits on the stone itself, which prevent optimal light return. You can also purchase a small ultrasonic cleaner (available in our maintenance package) and drop it in there once a week or so, or purchase our fine jewelry cleaner that comes with a brush and submersion tray. You may also take a soft toothbrush and dish soap and scrub around the stones in extra warm water. Enjoy a sparkling stone all the time! Always remove your ring when applying lotion! Because you use your hands all the time, center stones take a little abuse. This may cause them to loosen in the setting. You might not even notice that the stone is loose, if the stone is dirty, and the dirt is keeping it from rattling around! Tap gently on the stone. This will help you notice if the stone is moving in the setting. Whenever you can, stop by any jewelry store to get your stone steam cleaned. Have your stone checked professionally once a year to determine if the stone is safe and secure. Pearls are organic gemstones. Due to their porous nature, contact with the following should be avoided: all acidic substances, perfume, hairspray, vinegar, fruit juices, detergents, or alcohol. Perspiration can also harm the beauty of pearls, dulling their beautiful luster. Therefore, after wearing them, they should be wiped with a damp (not wet), soft cloth or a silicon cloth. 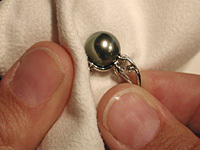 Avoid getting your pearl jewelry wet, as water can weaken silk thread and epoxy. Pearls in rings are almost always glued in place, so removing your pearl ring as specified above can help prolong it's security. Tap on your pearl to make sure that it is not loose. Even though pearls are exceptionally cohesive and shock-resistant, they rank only 3.5 to 4.5 on the Mohs hardness scale, so they may be scratched by contact with sharp objects or other gemstones. Extra care should be taken when wearing gemstone inlay jewelry. 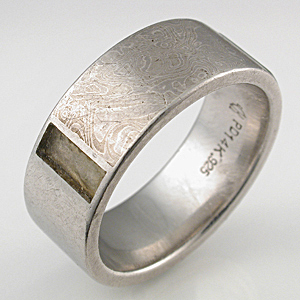 Rings with stone inlay should remain dry for maximum glue life. Unlike a bezel or prong, there is no metal securing the stone over its edge. Inlaid gemstones are set flush with the metal and glued into place. Through normal wear and tear, the bond can weaken, and the stone can crack, fall out, and be lost. We will happily repair or replace your gemstone inlay rings; normal repair fees will apply. Images: Jade inlay before and after it fell out (on two different rings). A high polish ring will take on small scratches pretty quickly, and scuff up uniformly over time. If you want to bring back the shine, a polishing cloth or cream will do the trick. It won't remove small dents and dings, but it will brighten the surface considerably. A brushed finish will show scratches pretty quickly. Fortunately, it is easy to refresh with Scotch-Brite. A nice way to resurface the ring whenever you desire is to take a small square of Scotch-Brite (the green scouring pad available at the grocery, drug or hardware store), soften it up in water and soap, and run it gently around the ring. Mixed finishes are the most beautiful and the most difficult to repeat at home. We frequently achieve a mixed finish with a combination of masking, blasting, and fine hand work. Polishing cream is great for around bezels, and other designs with recessed areas. 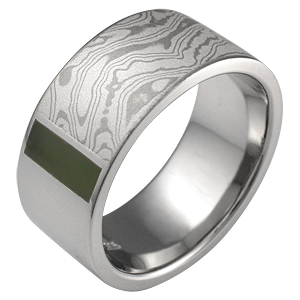 You can use a combination of a small square of Scotch-Brite on the mokume, and polishing cloth on the high polished surfaces, or use a soft toothbrush, polishing cream and a gentle hand around the whole ring, or forget about it and just send it in to us. If your ring has a darkened recess, avoid polishing cream. If the surface is brushed, a quick swipe with scotchbright will do; if the surface is high polish, a quick buff with a polishing cloth is the ticket. 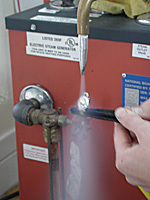 Rings with Stones: Have your stones steam cleaned and checked for security once a year. When to have your ring professionally refinished: Whenever you wish, but no more frequent than once a year. Some people go 2 years, some 5, and some let their ring age naturally. It is totally up to you.